Ansan mayor Jongil Jae was at the football centre in Seoul today for the handover of the police football franchise Ansan Mugunghwa to the city of Asan for the 2017 K League season. To offset the potential of a footballing void opening up again in Ansan after the 2012 departure of the Immanuel football franchise to Goyang, the mayor announced plans to create a new team: Ansan Citizen (안산시민구단). The mayor revealed that the city intended to build a sustainable and potentially profitable football team in the city based on the model of teams in countries like Japan. Therefore, the new Ansan team intends to begin on a small budget and build their way up. Addressing the rumour that if Ansan Mugunghwa, the police franchise team, were to win the second-tier K league Challenge, the new Ansan team would start in the K League Classic, the mayor stated that they expected the new side to begin in the Challenge, with that league better suiting a fledgling infrastructure. The mayor also revealed that they had been in talks with third tier side Ulsan Mipo Dolphins with the present Ulsan side potentially folding into the new Ansan team. 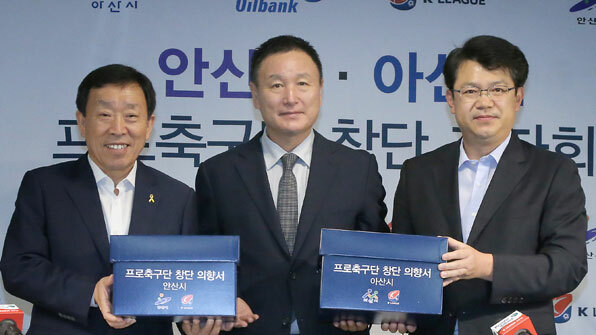 The mayor stated that he wanted to see the team built up from a base of around 30 players, and with the invalid draft system, this may prove a difficult task for a new side on a budget, therefore the acquisition of Ulsan players would be critical. In shaping his vision for the new Ansan side, Mayor Jae cited Ansan’s vast foreign population, a distinctive demographic feature of the city, referring to 80-90,000 of Ansan’s 800,000 people actually being of foreign origin. He talked about the team shaping an identify for Ansan citizens and also capturing the zeitgeist of the city by integrating a multicultural element into the teams colours. This is all much welcomed by Ansan Foreign Supporters Club, and as the oldest football supporters group in the city, we hope to build a good relationship with the new team.